Immerse yourself in Rye’s medieval history. Follow a scenic route around the town listening to tales of the past on your smart phone, tablet or other mp3 playing device. 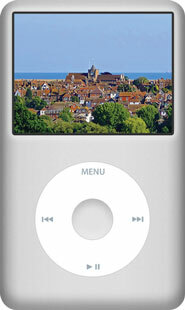 Download an audio tour for the picturesque, medieval town of Rye in East Sussex for just £2.99. This tour has been developed for you to download and play on your smart phone, tablet or other portable mp3 playing device. For just £2.99 you can download the tour (21.4Mb and 37 minutes long although the tour itself should take between one and two hours depending on how quickly you walk). You should also download this town map which is required to navigate around the town during the tour. NB: If you intend to play the audio tour on an Apple device without streaming via 3G or 4G network, you will need to download the mp3 to iTunes first on your computer and sync your device.